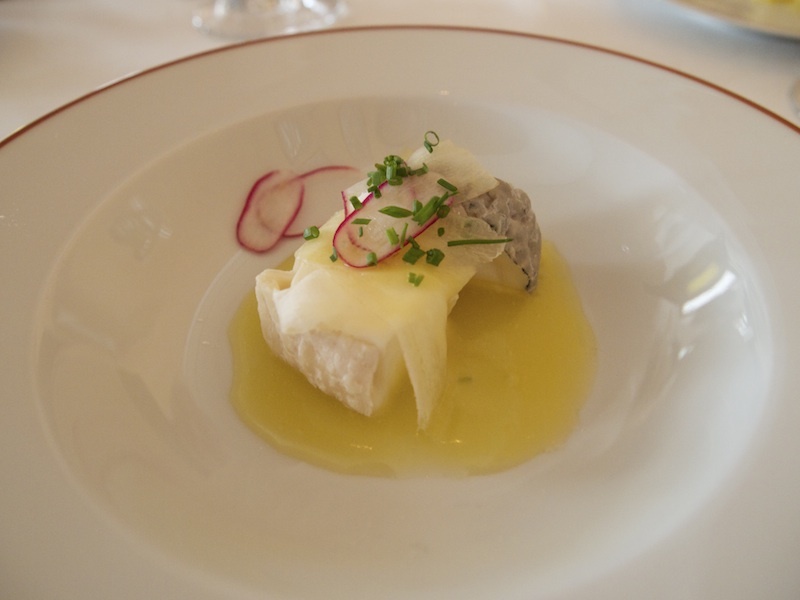 It needs no saying that Alain Passard is one of the greatest, active French chefs. If there is such a thing as a "Big Five" in French gastronomy, Passard certainly belongs in it, together perhaps with the likes of Alain Ducasse and Pierre Gagnaire, Michel Troisgros and Guy Savoy? He was widely regarded as the best rôtisseur in France (and, by consequence, in French eyes anyway, the world) until in 2001 he (as a celebrated three star chef) boldly eliminated red meat from his menu and decided to focus on vegetables instead - not a man afraid to throw away the rule-book! Alain Passard was born in 1956 in La Guerche-de-Bretagne into a family of artisans and artists. He started his training locally in 1971 (at the tender age of 14) at l'Hôtellerie du Lion d'Or at Liffré with a four year apprenticeship under chef Michel Kéréver. He then spent two years at La Chaumière in Reims (Gaston Boyer) and worked at L'Archestrate from 1977 to 1980, the then 3-star Paris restaurant of Alain Senderens. From 1980 until 1986 he worked at the Casino d'Enghien (initially one, later two stars) and the then legendary Carlton in Brussels (two stars). In 1986 Passard opened l'Arpège at the premises previously occupied by L'Archestrate and quickly obtained his first (1987) and second (1988) stars. The third star followed in 1996, ten years after the opening of the restaurant, and has been retained ever since. Nowadays vegetables are painting the world's restaurant menus more and more, but it is worth noting that Alain Passard (and even earlier Michel Bras), was one of the pioneers of this development and, looking back, his 2001 decision to radically change course was an epoch defining, seminal moment in modern gastronomy. The restaurant solely uses fruit and vegetables from their own three (biodynamic) vegetable gardens in Fillé-sur-Sarthe, Buis-sur-Damville and one in a bay opposite Mont Saint-Michel, each with their own terroir (made up from soil, climate and agricultural practices). If Passard eats as many vegetables as he serves his guests, this energetic chef is living proof that they are good for you; on the day we had lunch at his restaurant he had just flown back from Bangkok and this sprightly 57 year old seemed blissfully oblivious to the concept of jet lag! L'Arpège is open for lunch and dinner Monday till Friday. 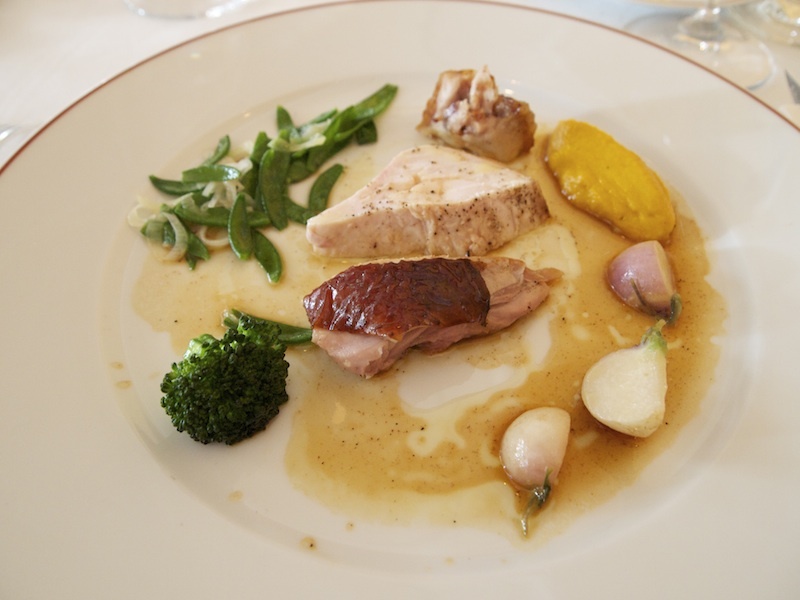 The restaurant offers an a la carte menu, a 9-course 'Menu Cuisine Choisie' for € 360 and there's a 9-course 'l'Éveil des jardins' lunch menu for € 130. I had lunch at l'Arpège with my husband on Monday 29 April 2013 and we both ordered the lunch menu (a bargain by Paris three star standards). We started the meal with some canapés. Crisp tartelettes with the following fillings: carrot, mustard and radish - turnip, beetroot, Parmesan, dill and radish - turnip and carrot. 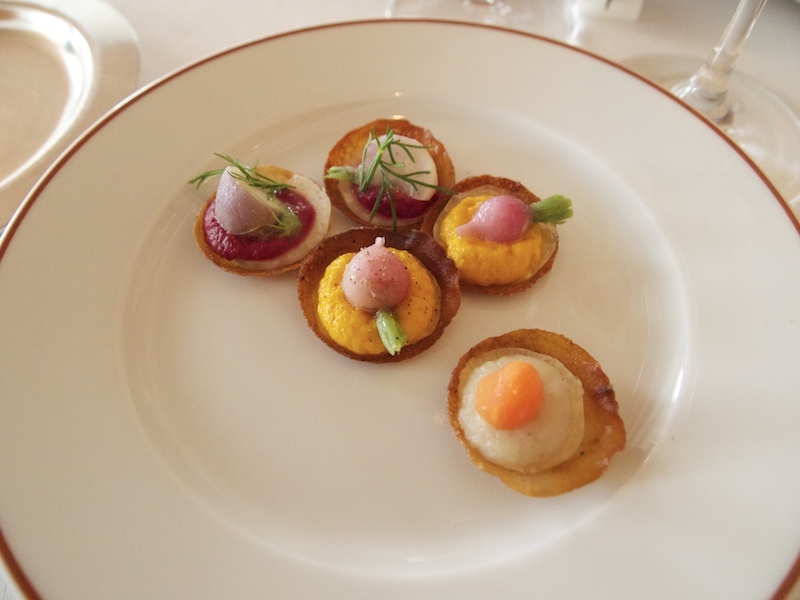 Three fantastic canapés with excellent flavours contrasts. Alain Passard's signature amuse bouche arrived next. 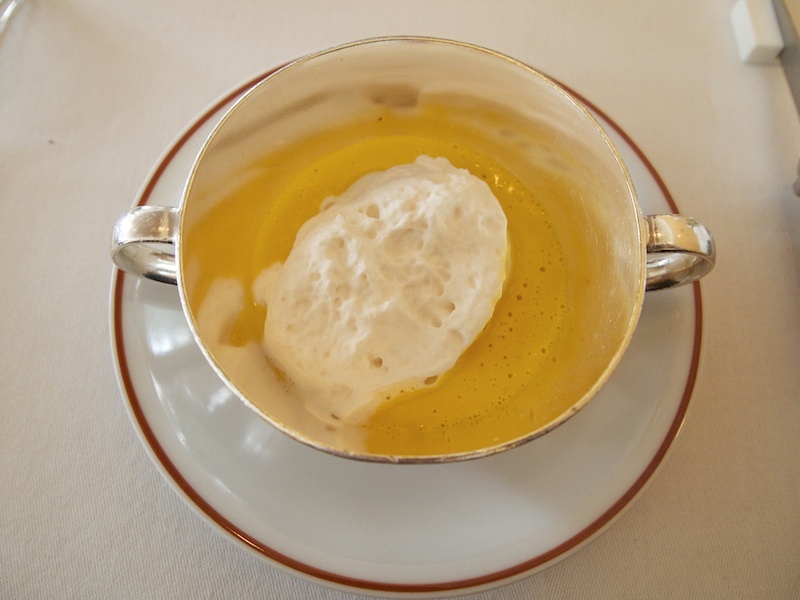 'Chaud-froid d'oeuf fermier, sirop d'érable' - hot and cold egg with maple sirup, a dish created by Passard in the early 1980s. At the bottom of the eggshell is a gently poached, warm egg yolk, which is covered by a wonderfully light cold cream, mildly flavoured with a balanced mixture of sherry vinegar, ginger, white pepper, salt, nutmeg and cloves. 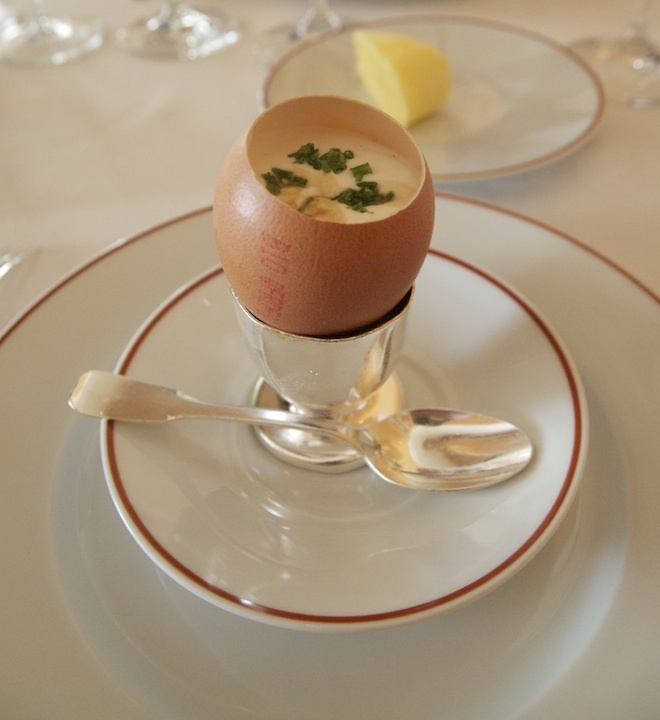 The egg is finished with a drizzle of maple syrup and a sprinkling of finely chopped chives. Lovely touch of sweetness from the maple syrup. Very well-balanced sweet, sharp and rich flavours, a feast for the senses. 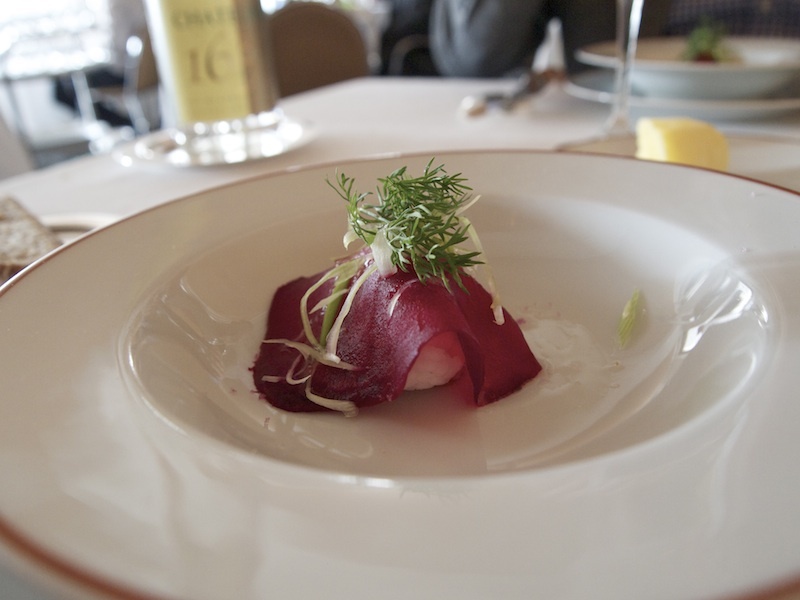 The first course of the lunch menu was Beetroot sushi, mustard (from Orléans), fig leaf oil, fresh garlic and dill. Lovely, moist rice covered with a thin layer of sharp mustard. A large slice of dark red beetroot was draped over it. Wonderful, fresh and clean flavours; pairing beetroot with mustard instead of the more usual horseradish is an original choice. After this first course the remaining dishes on the lunch menu were served in a somewhat random order. 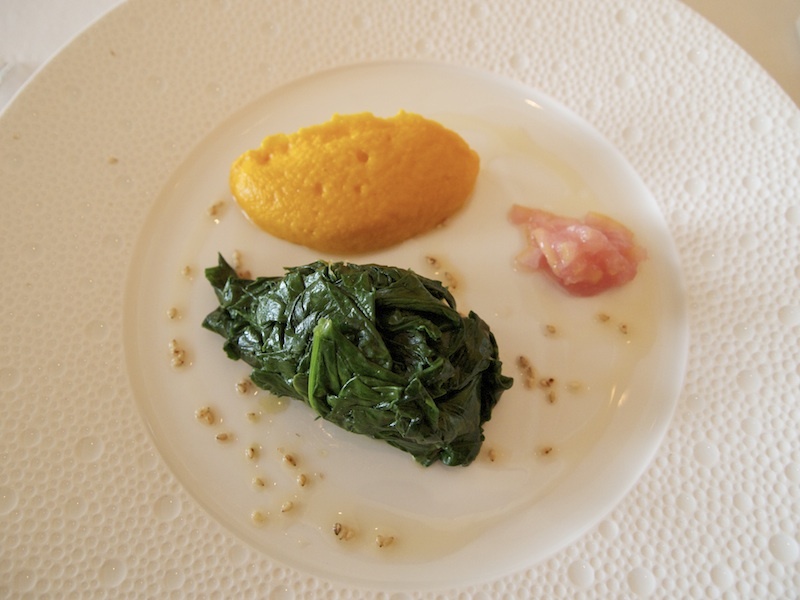 First up (second course) was an elegant dish of carrot and orange puree, wilted spinach, candied lemon with beetroot juice and a sprinkling of sesame seeds. The puree had a beautiful, light consistency and the carrot married perfectly with the orange. Both the puree and the spinach were great on their own, but when combined with the candied lemon, the flavours were elevated and intensified. An immaculate dish with a fantastic synergy between sweet and tart flavours, the sesame seeds delivering warmth, flavour and texture. Loved the subtle bitters in the aftertaste. 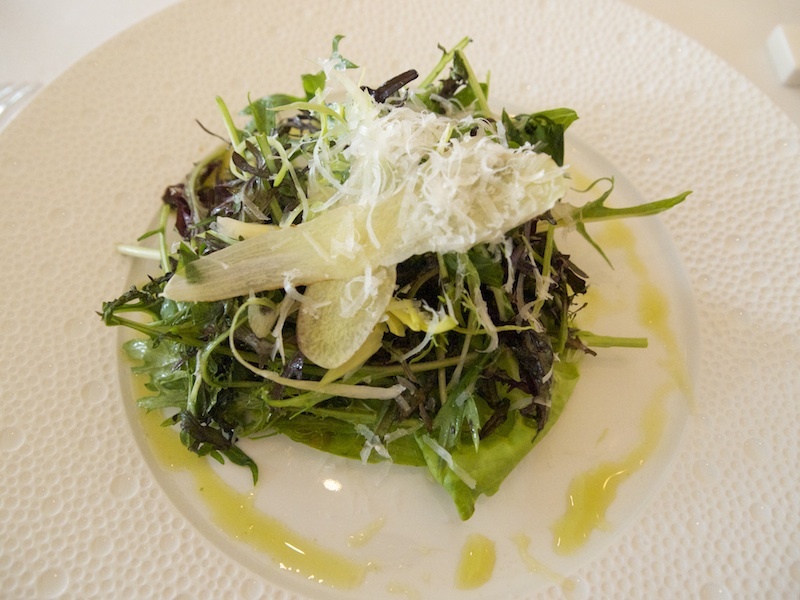 This was followed by 'Mesclun de Sylvain', a simple crisp salad of mixed leaves (selected by Alain Passard's head gardener, Sylvain Picard), such as mizuna, choho and mibuna, combined with thinly sliced radishes, carrot, grated Parmesan and delicious chopped hazelnut praline. Also on the plate was a drizzle of herb oil. Simple yet extraordinary. Next up was a dish that wasn't mentioned on the menu. 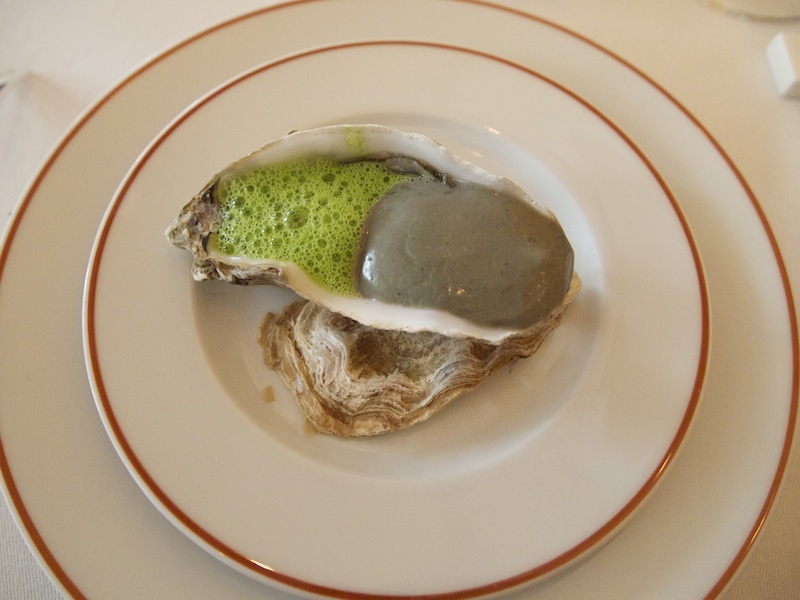 Oyster served with a light spinach foam and squid ink and garlic cream, the latter not the most attractive in appearance but perfectly balanced. Fifth course was an absolutely divine carrot and garlic velouté, served with a smoked bacon crème soufflée. Beautiful light and creamy velouté, the carrot delivering a lovely touch of sweetness. Fantastic airy and creamy smoked bacon (from the Black Forest) crème soufflée, with very refined bacon flavours and a hint of smokiness. A superb dish with hearty yet refined flavours. 'Vol-au-vent' with spring vegetables and fresh garlic arrived next. 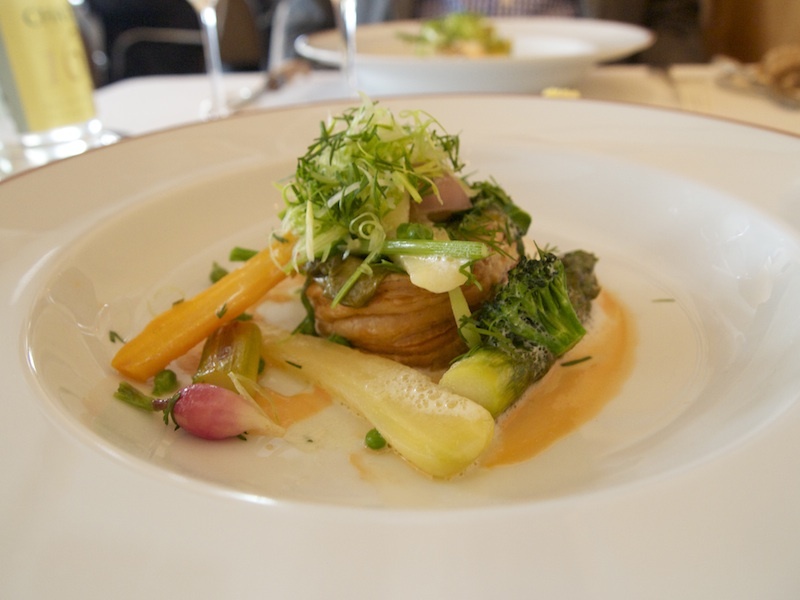 A perfectly crisp pastry case served with a symphony of beautifully cooked vegetables like carrot, baby fennel, baby turnip, broccoli, fresh peas, green cabbage, asparagus and shredded fresh garlic. Absolutely loved the different flavours and textures of the vegetables and the garlicky finish was fantastic. With the vegetables came a gorgeous sauce made from scallop coral and whisky. A perfectly conceived and executed dish. Seventh and main course was chicken cooked in hay. Fantastic, succulent and very flavoursome chicken with wonderful mild caramelised flavours and aromas from the hay, which also added a lovely touch of smokiness. The chicken was accompanied by baby turnips, mange tout mixed with thinly sliced shallot and broccoli, but best of all was a carrot mousseline, beautifully flavoured with cardamom, coriander and garlic; sensational. Next up was the cheese course. Two types of goat's cheese, Sainte-Maure (from the Loire Valley) and Tomme de Savoie served with thinly sliced radishes and carrot and a delicious fresh and sharp dressing of honey, lemon and olive oil. 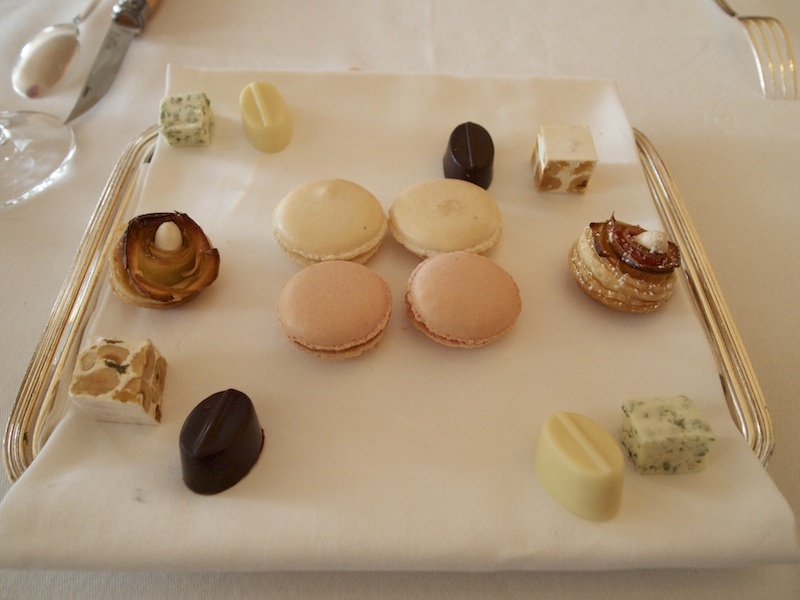 Before the ninth and last course a selection of petit fours arrived: coriander marshmallow, mint chocolate, rosemary chocolate, beetroot and honey macaron, carrot and rhubarb macaron, hazelnut nougat and Alain Passard's famous apple tart roses. Rhubarb millefeuille was next. 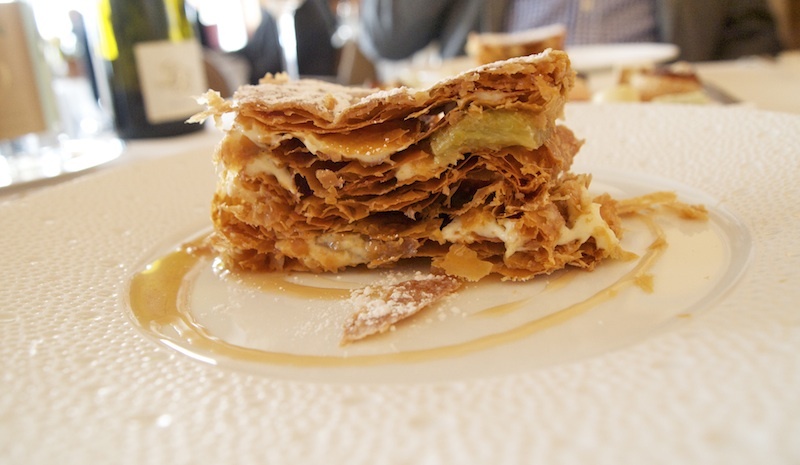 Pastry is a serious affair at l'Arpège and this millefeuille was outstanding. Perfectly thin, crisp and buttery pastry interspersed with layers of sweet and tart rhubarb and cream. So light, so delicate: perfection. 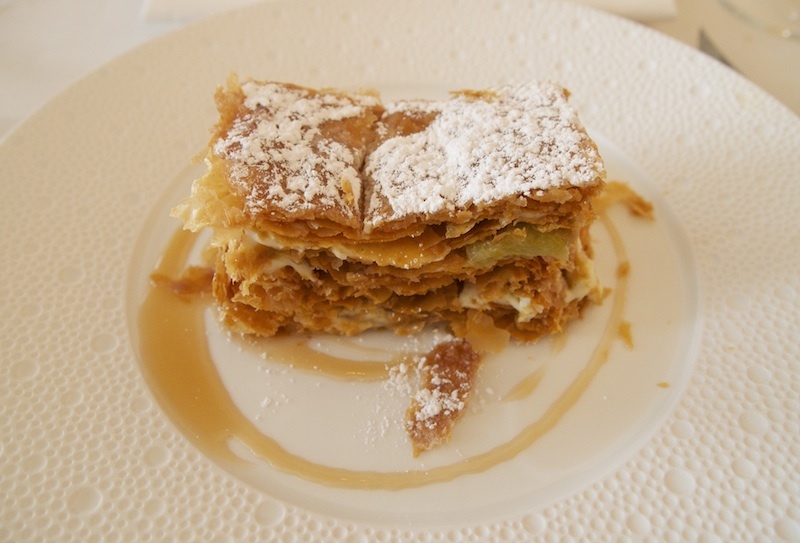 Drizzled around the millefeuille was a nice and sticky caramel sauce. Last to arrive was a delicious, creamy and floral hysop cream (no photograph). From a King of Rôtisseurs, Alain Passard has evolved in the past 12 years into a Pope of Vegetable Chefs. 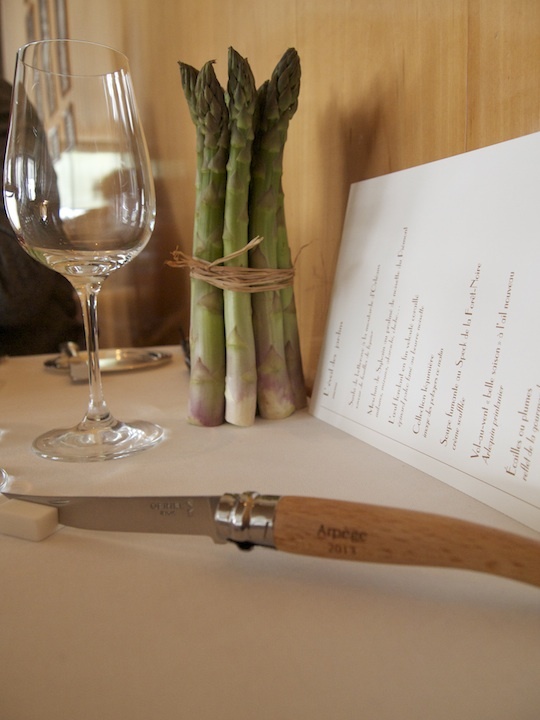 The superb produce from his three vegetable gardens is the foundation of his cuisine, but it is certainly not the alpha and the omega of what happens at l'Arpège. This is not a matter of "letting the ingredients speak for themselves". On the contrary, Alain Passard's cooking not only encapsulates the essence of the ingredients, but transforms these ingredients into dishes that transcend their constituent parts; minimalistic but dynamic dishes with the cleanest, yet most intense flavours.